Webinars are promoted in Concrete Decor magazine, online at www.concretedecor.net, our popular e-newsletters and social platforms. Sponsored webinars engage with and drive targeted audiences your way. Schedule an upcoming webinar with Concrete Decor and start generating leads today. Combine a webinar with your content marketing strategy to establish thought leadership, brand engagement and sales. Contact us at (877) 935-8906 for additional details and pricing that’s right for yo. Our sponsor-supplied webcast is Powerpoint based with verbal commentary and presentation content provided solely by the sponsoring company and moderated by a Concrete Decor editor. 1/3 page ad in Concrete Decor and a 250×200 ad that runs 2 months on concretedecor.net, concretedecorshow.com and in our e-newsletter. Sponsor supplies creative. Webinar will be promoted using 4-6 email blasts (announcing, save the date, attendance confirmation and reminders) to our house lists and posts on Facebook, blogs and Twitter. Concrete Decor will promote sponsored webinars in house ads in the magazine. Concrete Decor will help promoted your webcast with a two-month promotion campaign. This event does not include the use of Concrete Decor’s webinar platform – the sponsor will be responsible for originating the webinar. Registration and lead capture are the responsibility of the sponsoring company. 1/3 page ad in Concrete Decor and a 250×200 ad that runs 2 months on concretedecor.net, e-newsletter and concretedecorshow.net. Sponsor supplies creative. Webinar will be promoted using 4-6 email blasts (announcing, save the date, attendance confirmation and reminders) to our house lists. With new Topic sections at www.concretedecor.net providing focused content to online audiences, your webinar gets immediate attention. These convenient online events are presented by key industry artisans and expert manufacturers speaking on various hot topics in the concrete industry. You can be the exclusive sponsor of one or more of these events — engage with our audience and play a key role in the webinar event. Concrete Decor will handle all the event management, delivery (using webinar service provider), moderating and promotion. Sponsoring clients work with us on promotional creative content, primarily to ensure branding consistency, and participate in the event as the exclusive sponsor and topic contributor. Sponsoring company delivers a 45-minute, unbiased presentation to help Concrete Decor readers understand a given topic. A registration form captures viewer data, including contact name, company name, title, email, country and postal code (custom questions also may be added). The sponsor logo is included on the registration form, confirmation emails and promotional materials. 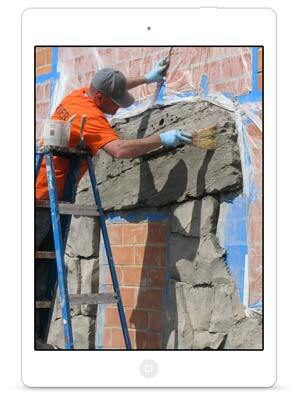 Your webinar is promoted across our platforms: www.concretedecor.net, e-newsletter, email and social media. Concrete Decor will promote the webinar program and highlight sponsors in host ads throughout the year. Sponsor will also promote attendance through standalone ad that is supported by an existing media program.